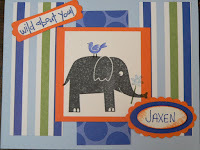 I put this card together for Jaxen's 1st birthday. I used Jersey Shore DS paper with Only Orange and Bashful Blue CS. The stamp set is from the Wild About You set.